Seeing as you already follow us on every available social platform it will come as no surprise that here at HY HQ (Nic’s bedroom) we have been planning and making a ‘how to screenprint’ film for quite some time now. Our primary goals were to expose ourselves (not like that), demonstrate what we actually mean when we talk about screenprinting, and most importantly to encourage others to CREATE STUFF, when all you have are bold ideas, loose change, Teresa May as the Prime Minister and £20,000 of degree debt from a polytechnic. It all started with a storyboard, which John meticulously revised over several months before putting to our buddies Ryd Cook and Carl Peck at filmmaking collective Project Trident. We wanted to show an introduction to our work and a simple step-by-step guide to the intricate trial-and-error process of screenprinting, but both Ryd and Carl are deranged and morally bankrupt so of course things took a turn for the weird. What we’ve ended up with, and I’m sure David Lynch wouldn’t mind us saying this, is a little like Mulholland Drive: leaves you feeling utterly confused, a little uneasy and surprisingly aroused. The first weekend of shooting was later written off as Nic had the flu and John was in the throes of an existential crisis, both of which were plainly clear on our pallid faces when we later reviewed the footage. 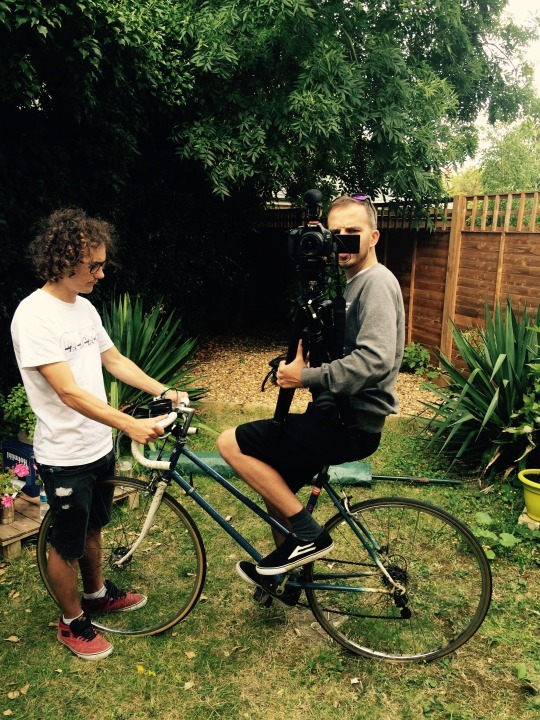 With renewed energy and developed ideas we threw ourselves into five days of filming in August, covering all the professional bases like ‘filming while on bike’, ‘filming while on skateboard’ and ‘making soundbooth from duvet’. We hope in an ideal world that after watching the film you might have learned a bit about the print process and would be interested in browsing our website, but we completely understand if you want to erase the names John/Nic/Carl/Ryd from your mind forever. You can drop us an email at hellohotyoghurt@gmail.com if you want to ask us a question, stock our work in your trendy pop-up shop or send us vitriolic messages. But, remember, in the wake of the twin nightmares of Brexit and Trump and with whatever else 2016 might throw at us in the remaining weeks, please, don’t be too harsh.